Actually, he did. A food has been “processed” when it is deliberately changed in any way before it is eaten. That means cooked meat, dried fruit, fermented grape juice, baked bread from milled grains, food preserved with salts, etc. — all of these are processed, and all of them were widely consumed in Jesus’ day. Jesus’ diet was mostly processed food. Of course, I know that isn’t what the Twitter commenter meant. She was referring to foods with ingredients like added sugars and artificial flavors, colors or preservatives. She was referring to cows fed with corn and chickens raised in cages instead of coops. She was referring things like potted meat made from “mechanically separated chicken” and “partially defatted cooked beef fatty tissue.” Yet the fact that Jesus didn’t eat such things (they weren’t invented yet), doesn’t mean that he wouldn’t. The odds are that he probably would. In truth, the question of what Jesus would eat today is not nearly as complicated as people make it out to be. Jesus declared “all foods clean” (Mark 7:19) and told his followers to “eat whatever is set before you” (Luke 10:8). Paul adds that we should do this “without raising any question on the ground of conscience” (1 Corinthians 10:25), for “everything created by God is good, and nothing is to be rejected if it is received with thanksgiving” (1 Timothy 4:4). Oh, and don’t make too big a deal of what you eat, either (Romans 14:17, 20). Speaking of not making too big a deal of what people eat, this is right about the time when someone will surely say to me, “Physician, heal thyself!” (Luke 4:23). But I’m not making a fuss about food; I’m trying to quiet the food fussers so that God’s people can get back to eating without fear, shame or guilt. God wants you to give thanks, and his call for gratitude occupies the first eight of ten spots on the “How Christians Should Eat” list. “For everything created by God is good, and nothing is to be rejected if it is received with thanksgiving” (1 Timothy 4:4). Among the many glories of creation that “once lay locked in its depths” are goods like coffee, the most popular beverage in the world (after water). God didn’t make coffee. He only made the coffee plant. It was man who cultivated the varieties. It was man who picked and washed the cherries. It was man who roasted the beans and ground them into powder. And it was man who processed these raw materials and spun them into the gilded glories of a cappuccino, a café Cubano or a nitro-hopped cold brew. And time would fail me to tell of the many other processed goods that manifest the wonder of God’s world, from gluten to goat cheese to GMOs. God gets the credit for any goodness these things contain because every gift comes from him, even the “indirect” gifts that humans unlock from the dormant depths of creation’s rich potentiality (James 1:17). “The earth is the Lord’s and the fullness thereof” (Psalm 24:1). This is not to say that everything man manufactures is automatically and exclusively good. Of course. A thousand amens. But too often well-meaning Christians assume that “natural” is better, because “God made it that way.” (Although it’s funny how quickly most of us jettison that way of thinking when it comes to clothing, houses, haircuts or makeup.) When it comes to comestibles, the naturalness of a thing does not determine the healthfulness of a thing, and there are even manmade substances that are more beneficial than purely natural substances. In our love for God’s world as it is, we must not forget that God designed it to be developed and created us with this purpose in mind. We must not forget the massive gifts of modern technologies that allow us to sustain the highest population the world has ever known. And we must not forget that God’s world does not end in the wilderness, natural and pristine. It ends in a garden-city adorned with manmade contributions showcasing “the glory and honor of the nations” (Revelation 21:24 — 22:6). The upshot of all this is a lot to be thankful for, from cheap groceries to good coffee to deep-fried glazed doughnuts. (Because God didn’t have to make a world with delectable potentialities like sugar and gluten, but — εὐλογητὸς ὁ θεὸς — he did.) The banquet tables at the Marriage Supper of the Lamb are going to be quite large, it turns out, with plenty of room for all sorts of manmade goodies. Many of the things that we made here will find there way there, and every last one of them will be drenched in the gravy of grace. But there’s no room at the table for disparaging remarks about the unlocked glories of creation. Because God is great, and God is good. So let us thank him for this food. 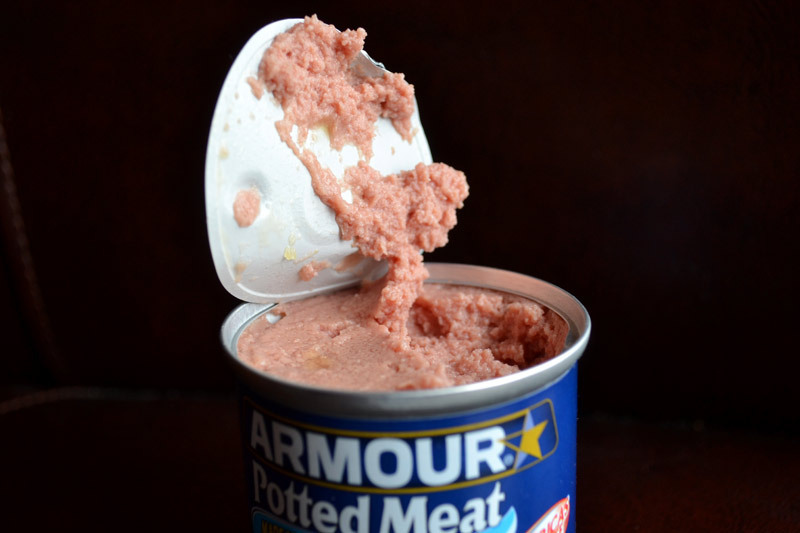 Even the potted meat (Isaiah 25:6). The International Food Information Council Foundation defines “food processing” as “any deliberate change in a food that occurs before it’s available for us to eat.” Cf. “What Is a Processed Food? You Might Be Surprised!”, September 2010. http://www.foodinsight.org/sites/default/files/what-is-a-processed-food.pdf. Abraham Kuyper, Rooted & Grounded: The Church as Organism and Institution (Grand Rapids, MI: Christian’s Library Press, 2013), 7. There is wide disagreement on the Internet as to whether coffee has finally surpassed tea for the top spot (after water). For the purpose of this article, however, it doesn’t much matter which of the two ranks higher, as the point is the same. For example, the antibiotic properties of certain naturally-occurring essential oils pales in comparison to the power of synthetic antibiotics used in hospitals today. Yet both the oil and the pills are gifts from God, and both should be received with gratitude and used with wisdom. — God Bless Gluten originally appeared at Intersect.